Die Flagge Südwestsomalias zeigte drei größere horizontale Streifen in Somalia-Hellblau, Rot und Grün. Jedoch war der rote Streifen schmaler und durch zwei dünne schwarze Streifen von der übrigen Flagge getrennt. Im blauen Streifen befand sich nahe am Mast ein Ring aus sechs Sternen. Sie könnten für die sechs Südprovinzen Somalias stehen, die einst zu Südwestsomalia gehören sollten. The flag of Southwest Somalia showed three biger horizontal stripes in pale blue of Somalia, red and green. But the red stripe was some narrow and separated from the rest of the flag by two fine black stripes. In the blue stripe was placed near the pole a ring of six stars. 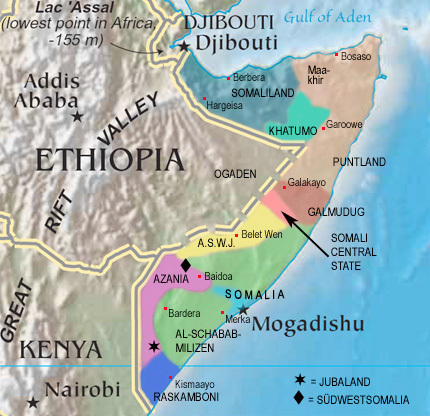 They could stand for the six southern provinces of Somalia which once should belong to Southwest Somalia. Zur Bedeutung der Farben ist nichts bekannt, wobei die Verwendung des Somalia-Hellblau auf die bisherige Somalische Symbolik zurückgeht. Die Farben Rot und Grün sind offenbar von zentraler Bedeutung für das somalische Volk, denn die Farben tauchen auf Somalischen Flaggen immer wieder auf (Somaliland, Ogaden, WSLF, SPM Jubaland). Grün steht sicherlich für den Islam. About the meaning of the colours is nothing known, but the using of the pale blue of Somalia goes back to the hitherto Somali symbolism. The colours red and green are obviously from pivotal significance for the Somali people, because the colours arise on Somali flags again and again (Somaliland, Ogaden, WSLF, SPM Jubaland). Green stands certainly for the Islam. Der Staat Südwestsomalia wurde im April 2002 durch Oberst Hassan Mohammed Nur Shatigadud von der Rahanweyn Resistance Army (RRA) ausgerufen. Die Rahanweyn sind ein Clan, der hauptsächlich in der Provinz Baidoa und der nördlich davon gelegenen Provinz Bakol lebt. Südwestsomalia beanspruchte immerhin alle sechs Südprovinzen von Somalia (einschließlich Jubaland), jedoch residierte Präsident Mohammed Nur ausschließlich in Baidoa, und wurde sogar noch in 2002 kurzzeitig aus Baidoa vertrieben. Jubaland verblieb unter der Kontrolle der JVA-Miliz. Im Jahre 2003 übernahm Ibrahim Habsade  der Vizechef der RRA  die Macht in Südwestsomalia. Im Jahre 2005 floh die somalische Zentralregierung nach Baidoa und vertrieb die RRA. Damit endete die kurze Geschichte Südwestsomalias. Im September 2006 wurde Baidoa von Truppen der radikalislamischen "Union islamischer Gerichte" erobert, und im Dezember 2006 von Truppen Äthiopiens und Somalias besetzt. The State of Southwest Somalia was proclaimed in April 2002 by Colonel Hassan Mohammed Nur Shatigadud from the Rahanweyn Resistance Army (RRA). The Rahanweyn are a Clan which primary lives in the provinze of Baidoa and in the northern situated provinze of Bakol. Southwest Somalia demanded nevertheless all six southern provinces of Somalia (including Jubaland), but President Mohammed Nur resided solely in Baidoa, and was even still in 2002 momentary exiled from Baidoa. Jubaland remained under the control of the JVA militia. In 2003 Ibrahim Habsade  the vice chief of the RRA  seized the power in Southwest Somalia. In the year 2005 fled the Somali central government to Baidoa and banished the RRA. In this way ended the short history of Southwest Somalia. In September 2006 Baidoa was conquered by troops of the radical-islamic "Union of Islamic Courts" and became occupied in December 2006 by troops of Ethiopia and Somalia.